With her dual philosophical and artistic training, Sandrine Deumier constructed a multifaceted poetry focused on the issue of technological change and the performative place of poetry conceived through new technologies. 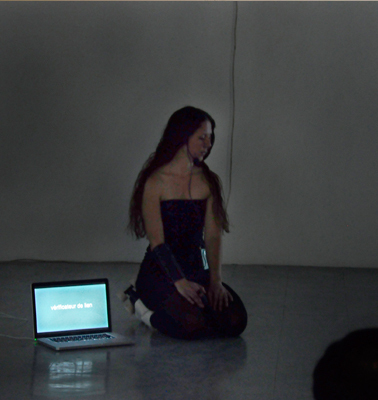 Using material from the word as image and the image as a word vector, she also works at the junction of video and sound poetry considering them as sensitive devices to express a form of unconscious material itself. The process of writing and the mobile material of the image function as underlying meanings of reflux which refer to the real flickering and to their reality transfers via unconscious thought structures. Her work consists mainly of texts, digital poetry, multimedia installations and audiovisual performances in collaboration with composers. Proposal Summary: Video installation. Through the apparent variety of cybernetic bodies, the series Affordable Dreams present fictional variations of state of consciousness. In this dehumanized dream world, connected or/and augmented bodies stretch out in remained desirous objects to turn out to be just the reflection of their own affective machines.